We do know that Japan is the centre of attraction with some of the weirdest and coolest smartphones in the world but how about a smartphone which alerts you about the amount of radiation in the area you are currently situated in? Well Sharp has launched the Sharp Pantone 5 107SH which is an Android 4.0 Ice Cream Sandwich smartphone which arrives with a one-key access to the radiation detection app. After last year’s Fukushima radiation tragedy in Japan, many people have actually opted in for carrying their own radiation meters so that they could measure the radiation in any given place and stay safe. But we really hope that buyers of this smartphone don’t have to use this detector ever. To know about the radiation levels in any area, all the user has to do is press the big round physical button on the front of the device which would activate the dedicated radiation reader app and give you almost accurate results in just 10 seconds along with a map. Other than this radiation reader, the 107SH arrives with a colour choice of 8 colours which gives users a lot of options depending on their choice. And with the Android 4.0 ICS, other specs of the smartphone include a 3.7 inch WVGA screen, powered by a 1.4 GHz single core processor, is only 12mm thick, arrives with a 4 MP camera at the rear and is also water proof and dust proof. 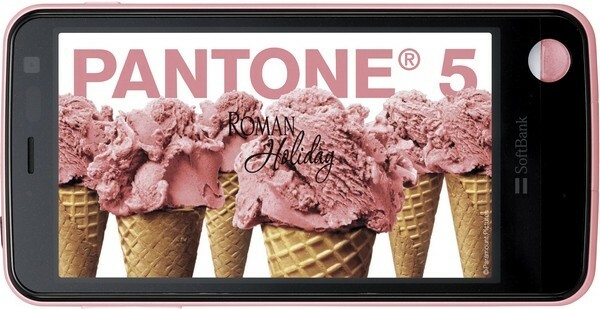 Price of the Sharp Pantone 5 107SH has not been unveiled but the smartphone will be on sale in Japan from mid-July.